MAN vs, WOMAN vs, robot vs.dinosaur! Don't even try to tell me you havne't wondered who would win in a battle between history's greatest titans. That's right, I'm talking about an epic battle between a robot, a dinosaur, a man and earth's greatest threat of all... a woman! Man vs. Woman is short film from 2006 directed by Juan Carlos Vargas who has done a tone of FX supervosing for films like SyFy's Annihilation Earth and TV's Lake Placid 3. Vargas also has a really cool sounding project in the works called Elimination about a bunch of actors who audition for a reality show for a million dollars. All they have to do is survive three killers, and each other - streaming live over the Internet. It was in dev in 2010, but we haven't heard since then so I hope we hear more from it soon. 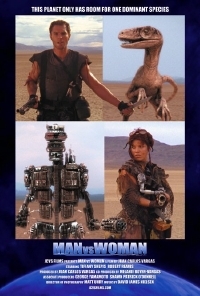 A science-fiction action film about an explosive duel between four desperate scavengers -- a man, a woman, a cloned velociraptor and a heavily armed robot - fighting for survival on a desolate dry planet. Watch the entire match after the break!!! I loved it, amazing movie!!! Hilarious ending! Make more!